This is not a joke, the developers of the service Google Analytics added a new tool to track the traffic of any resource in real-time mode. 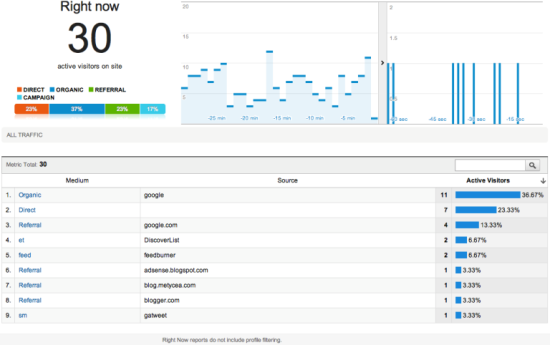 A new tool has its own name that is Google Analytics Real-Time. The service is available only in the new version of the interface, so if you still use the old one, then change the habits. Of course, if you want to track in the real- time mode. The developers believe that Google Analytics Real-Time will help the webmasters to track the popularity of various materials on the resources. Previously, the traffic tracking was also possible in the real-time mode, but for that purpose were used the third-party tools and services, for example: whos.amung.us.